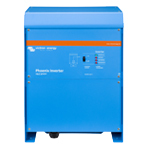 Please contact us for any questions relating to inverters. We will gladly help you in choosing the right inverter for your application. These high quality inverters are available in 12 Volt, 24 Volt and 48 Volt configurations. They are ideal for use in Renewable Energy Systems , Telecom Systems, Backup or Stand-by Systems, Boats, Caravans or indeed anywhere that inversion from DC Voltage to AC Voltage is needed. They are Pure Sinewave Output, have high peak power and have a high efficiency. Models range from 150VA to 5000VA per module. Scalable: Up to six Phoenix Inverters 5000 can be paralleled in single phase, split phase and three phase configuration. Please visit our online shop, MPE-Online for online purchases or alternatively contact us for any queries that you have.